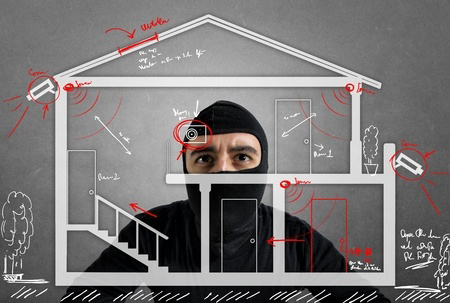 Protect your home & valuables - Top tips! How can I better protect my valuables at home? As the summer draws to an end, many of us are heading back to work after holidays abroad or staycations here in the UK. Some of you may be teachers or parents who have had most of the holidays off and have thusly spent a lot of time coming to and from your home all day long. In short, a lot of us have spent more time at home than we would normally do and now that the new academic year is upon us, some of your homes may suddenly become vacant from 9am-5pm again. During the holiday periods, routines are often lacking, which means that suspecting burglars have a more difficult task on their hands. So now that we are leaving the joy of summer behind, what can you do to keep your home a bit safer? An obvious one but nonetheless needs mentioning. Efficient locks on doors and windows is integral. An alarmingly high percentage of burglaries happen simply because the doors or windows were not locked or were not locked properly. When you leave your house for work in the morning, ensure that the windows are locked, even if they are on a latch, ensure that it is locked and unmovable for a burglar. Secondly, check all other entries to the house which are not your front door. Are the doors locked? This all may sound silly and completely obvious, but if you live in a home with other people, things can get overlooked. Once you have checked the windows and doors, keep keys out of sight and any other items which may catch a potential intruder’s eye. If you have blinds, keep them at an angle to distort the view of someone looking in. Carrying out these tasks makes it a lot harder for a potential intruder to gain entry to your home and will hopefully deter them from any pursuit. Last but not least, the front door. Ensure you have locked it, double locked it, whatever it is that you normally do. The front door being locked properly can really make all the difference. Lots of us have them and lots of us do not use them properly. If you have an alarm, set it every time you leave the house and if possible, every night before you go to bed. If you have one but it’s been disconnected, or perhaps you have never known it to work and it has been broken since you moved into the house, call the company it has been provided by to see whether it is fixable (if this is something you would like to do). You could also contact a local professional and get some advice or arrange a call out; this way they can have a look at what remains of your alarm system and you can go from there. Due to pets and various other reasons, some people have abandoned the house alarm. That is a decision a lot of people have made and it’s not necessarily a bad one. However, the alarm company sign outside your home is still worth keeping. The sign alone has been proven to deter burglars; so if you are completely without any alarm or deterrent sign, it may be worth even getting a mock one put up. The question we have posed is how to keep valuables safe. Some valuables cannot be locked up when you leave your house every morning. Taking the TV off the wall and hiding it is really not going to achieve much, other than causing you stress and a back ache. However, heirlooms, sentimental items, expensive jewellery can all be kept protected in a safe. There are many different kinds – you may already have one in place but it needs a bit of TLC. If a safe is something you are interested in installing, then honing in on a particular type of safe depends on what you’re trying to protect. You will also want to consider where you could or should put it for maximum safety and also for convenience. When choosing a safe, bear in mind that if it is a cheap, tin-pot style, then it’s probably not going to do much if an intruder enters your home. However, that does not mean you need to spend a fortune, but you may want to consider having a discussion with a reputable locksmith to be aware of the options available. If you’re serious about wanting a safe and you have some priceless, irreplaceable items you would like to protect, then you will want to be assured that the safe you have will actually do the job you expect of it. If you do any or all of these things, then you are doing your house and valuables a favour by protecting them just that little bit more.